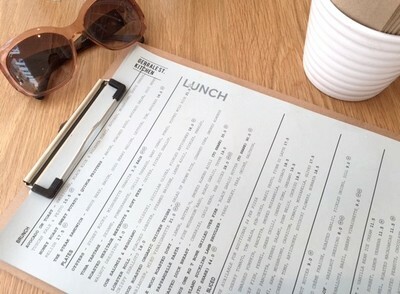 Gerrale Street, located just a block away from the sandy shore of Cronulla Beach, is brimming with cafés and eateries. One such place, Gerrale St Kitchen, which opened earlier this year aims to bring LA dining trends to the heart of the Sutherland Shire with its vibrant flavours and modern dishes. Gerrale St Kitchen opened its doors in January this year. Café by day, restaurant by night, Gerrale St is a sprawling expanse of a restaurant that boasts four different eating spaces; from the small take away café next door, to the main dining and bar area, and the sun dappled terrace with its glass ceiling. Elements of modernist design prevail here; clean lines and blonde timber flooring are subtly embellished with a warm neutral colour palate, monolithic surfaces and hanging white pot plants. The sun dappled terrace is the perfect place to enjoy a lazy lunch. The open kitchen, which extends the length of the venue, is a real showpiece and adds life to this minimalist set up. The kitchen is open for breakfast, lunch and dinner every day. These sweet potato fritters a tasty, but tiny. The menu here has a very 'hip' vibe. Goji berries, activated almonds, yuzu curd and textures of kale - whatever that means - make an appearance on the menu. 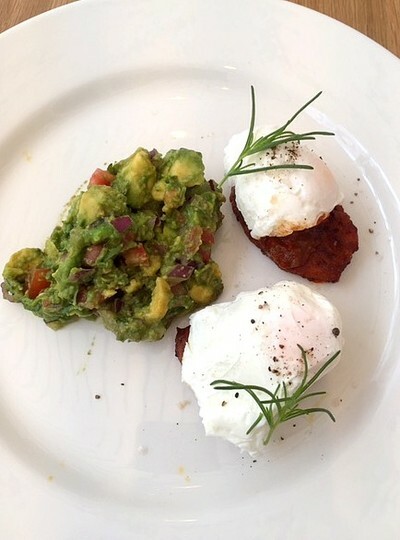 Sydney café fav, avocado on toast (15.50), also makes it's mandatory menu appearance. If you'd like to step outside the box though, without wandering too far and getting lost, the honey roasted sweet potato and quinoa fritters with bacon, poached eggs and goji berry relish are tasty and make for a good compromise - although for the price of $17.50 the portion seems a little lacking. Gourmet street food is all the rage. The lunch and dinner menus replace chia seeds with more comforting produce and offer big, bold dishes packed with flavour. The suckling lamb shoulder is earthy and tender, and the whole wood roasted fish is fresh and smoky. Both these dishes come unaccompanied however, so ordering a salad ($8-9) or some crispy baby potatoes ($9) is probably in order. 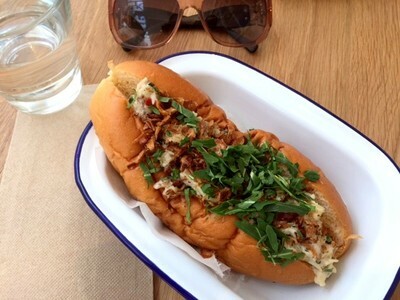 Salads of tiger prawns, crispy duck and pulled lamb make for a tasty lighter lunch option, as does the lobster roll ($18) which takes a classic East Coast USA street food and gives it a gourmet makeover with a luscious brioche bun, tangy aioli and crispy fried shallots. 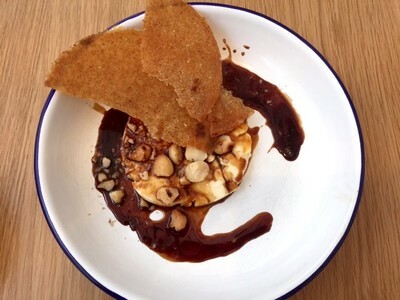 Lusciously creamy - the vin cotto pannacotta. No languorous meal is complete without something sweet, and Gerrale St Kitchen does indeed boast a small dessert menu. Creamy pannacotta, tangy vin cotto and toasted macadamias ($11.50) combine to make a lush dessert that avoids overwhelming the palate through a careful balance of sweet and sour, while ricotta doughnuts ($11.50) rolled in cinnamon sugar and served with pecan ice cream and lashings of chocolate are unashamedly indulgent. 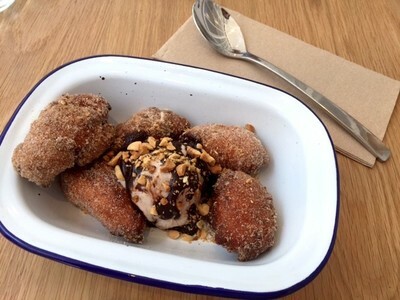 The grown-up version of cinnamon doughnuts. 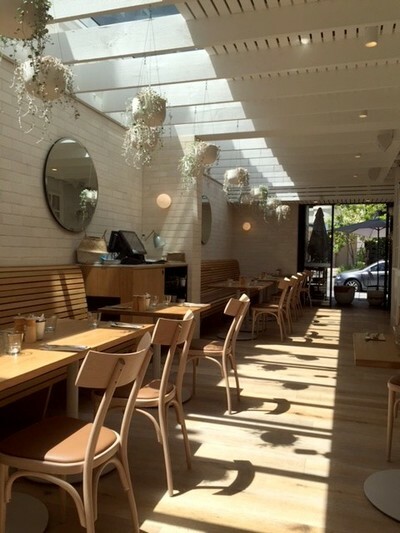 While Gerrale St Kitchen is flawless stylistically, technically, it is a little lacking. The service for instance is dry and slow - so prepare yourself for a lengthy affair when dining, and if you'd like to order anything else - or pay your bill - you'll have to flag down a waiter or head up to the counter. Additionally, as the menu relies heavily on seasonal produce, some menu items are often unavailable. While the food is undoubtedly tasty, once you've received it that is, the overall impression left of Gerrale St Kitchen is one of style over substance. Where: 19-21 Gerrale Street, Cronulla, 2230. Cost: Breakfast $9 - $18. Lunch and dinner $14 - $90. Dessert all $11.50. When: Monday - Friday, 8am till late. Saturday and Sunday from 7am till late. Good for kids: Yes. There is a lot of space, so ideal for prams and there is a small children's menu.